After low back pain, neck pain is the next most common problem we see in our office here at Surprise Chiropractic. The following tips are what I send my patients home with to help them through the first few tough days. Avoid positions that are painful. Lying on your back experiment with using pillows to support the neck in different positions. Sometimes tilting the neck to the side or slightly forward will relieve some of the pain. Also, experiment with different arm positions, sometimes moving one or both of the arms of the head can relieve some of the pain. Reason for the tip: Swelling in and around the joints of the cervical spine can put pressure on the nerves, certain postures create more space around the nerves and relieve the pressure. Icing 20 minutes on and 40 minutes off, continuously. There is a reason why the world’s richest pro athletes use ice all the time for their injuries … it works better than anything else at reducing inflammation and pain. In the early stages of your injury do not use heat because it will keep the area swollen, instead focus on cold. Since it is easy to lose track of time, a good rule of thumb is once your skin feels about as cold as the ice, then it has been about 20 minutes and is time to remove the cold. Once that same tissue feels about the same as tissue on the opposite side of the body then you have warmed back up enough to reapply the cold. Make sure you put a thin cloth between the cold source and your skin. If you can swing by the office we carry some “old school” ice bags that you can put directly on the skin, they don’t leak at all, and you can’t burn yourself because the ice bags stay at 34 to 40 degrees. Unfortunately, the convenient cold packs have additives in the solution that allow them to be colder than ice and are likely to burn you if you leave them on too long. Reason for tip: In a severe injury the body is flooding the area with fluids filled with chemicals that will help heal the injury. Unfortunately so much fluid is packing into the area that it becomes swollen and the circulatory system goes into a gridlock situation where nothing gets in and nothing gets out. By applying cold therapy it causes the blood vessels to constrict and squeeze excess fluid out of the area including waste products that are generated by the injury. When you take the cold off and the tissue begins to warm up again the body now can flood the area with chemicals that will help facilitate the healing process. Performing the cold therapy repeatedly helps to pump the waste products out of the area and draw the healing products in. A neck brace can make your suffering a little easier. At the very least it may allow you to move around with less pain. You should only wear it when in severe pain and if you have to wear it in bed to help you sleep. Once you can go without it, discontinue use immediately as you will heal faster if the joints in your neck are unrestricted and able to move more normally. Most drug stores carry the common foam “cervical collar” which is sufficient for most people, but we carry inflatable cervical collars which can actually provide moderate traction which can help with more severe cases. Reason for tip: If the nerves of your neck are aggravated they will be sending your neck and upper back muscles into a severe spasm. The muscles of the neck and back go into spasm and create your body’s own “neck brace”. 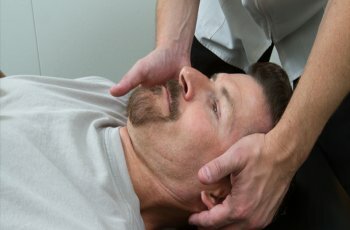 After 12 hours of constant unrelenting spasm, the neck muscles that are protecting the injury sometimes begin hurt more than the neck joints that are the cause of the original pain. If the neck brace can keep the neck from wobbling around it will allow the neck muscles to relax just a bit. As soon as you can tolerate it you need to get the neck and upper back moving gently. 30 seconds stretching the neck to each side in painless range of motion should be attempted after each icing session. As symptoms reduce I recommend a series of neck and back exercises that I will post at a later date. If you hurt too bad to go to work without using drugs, then you shouldn’t go to work. There are many topical analgesics that you can rub into the skin that can ease your symptoms a bit. (“Bio-freeze” is a good one.) If you choose to ingest over the counter medications to cover up your pain please be very careful. If your body is injured and the pain killer works well enough to allow you to go back out into your yard to finish trimming the rest of your trees, you may be ignoring the last warning before you do severe damage.